Meringue is a brilliant sweet treat that every good cook should learn how to make. The perfect meringue will be your “old-faithful” when you need a plate of something sweet. Or make meringues when you’re stuck with leftover egg-whites after making that fantastic Hollandaise or homemade mayonnaise. My mother makes her legendary meringues for every occasion. It features at birthdays, christenings, funerals, school functions and tea parties. Her version is two delicate meringues sandwiched together with whipped cream. She then rolls the creamy bits in crushed peanuts. (I know, the crushed peanuts don’t sound very glamorous.) But believe me, it tastes like heaven! Meringue sandwiches with cream and crushed peanuts. I’ve tried flaked almonds in the past (I thought it is more glamorous). But it didn’t live up to expectations. The egg-whites contain specks of yolk. The bowl or beater is greasy. The sugar is added before the whites are whipped really stiff. It is not whipped for long enough, or an inferior beater is used. The oven is too hot and the meringues burn instead of dry out. It is baked at the same time as other dishes. If there is steam of other food, the meringue will not dry out. Wherever I take a plate of my mother’s meringues, people beg me for the recipe. 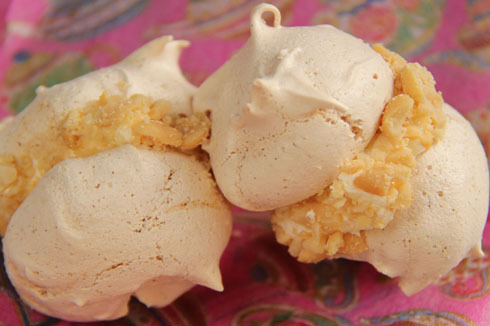 It is a typical French meringue recipe, but the secret ingredient is…….the crushed peanuts. Beat the egg-whites to soft peaks, but not dry. Add castor sugar a spoonful at a time, while beating the mixture to form stiff peaks that are thick, smooth and glossy. Fold in the vinegar, baking powder and vanilla essence. Line a baking tray with baking paper or foil (shiny side down). Use a teaspoon and spoon individual meringues on the lined baking tray. Bake at 140°C for 45 min, turn the oven to 100°C and bake for another 45 min (see Mom’s Tips). Spread a thick layer of cream on one meringue and stick another one on top to form a meringue sandwich (see Mom’s Tips) . Roll the meringue sandwiches in the crushed peanuts to cover the cream. Before you take it out of the oven, test whether the meringues are done. Take out one meringue and let it cool for 5 min. Break it open. If it looks as if the sugar is starting to caramelise on the inside, it is ready and you can take the batch out of the oven. If not, switch off the oven and let it cool in the oven. But check it regularly!! You can make the meringues up to three days in advance. Store it in an airtight container. Prepare your meringue sandwiches only an hour before you plan to serve them. If you master the art of meringue, it will open the door to a world of impressive desserts that makes you look like a pro. How do you use meringue to create fabulous recipes? This blog is about the food loves and traditions of my Afrikaans family living in South Africa. Here you’ll find a mix of recipes, family memories, food philosophies, travel adventures, good reads, and all the other food stuff that I care to comment on.